Set within the grounds of the Petrovaradin Fortress, on the right bank of the Danube river which runs through the heart of historical Serbian town of Novid Sad, EXIT possesses one of the most mind-blowing and iconic festival sites in the world. A shoe-in for every raver within a 500 mile radius of the region and a place that for the past 18 years has carved out a reputation as a must-see for any heavyweight raver dedicated to the dance floor. A true cocktail of a line-up soundtracks each night with the agenda running from 8pm – 8am for four nights on the bounce. Thursday evening rapidly becomes Monday morning as your understanding of the intense melting pot evolves from telling your mate not to leave your side to reaching expert level in fortress orientation. There’s no denying the mini pilgrimage that takes place to reach EXIT, but what awaits is a unique festival experience away from the norm. An amphitheatre of the rave, possessing those timeless 10/10 dancefloor moments you take to the grave. Here are the highlights from our unforgettable journey. Played by Amelie Lens on Thursday night: As we reach the top of the steep incline that’s led us all the way from the town centre to the middle of the fort, we just about have time to throw a honorary dab in the direction of Migos while they play on the main stage. Of course next on the list is a trek to the MTS dance arena. 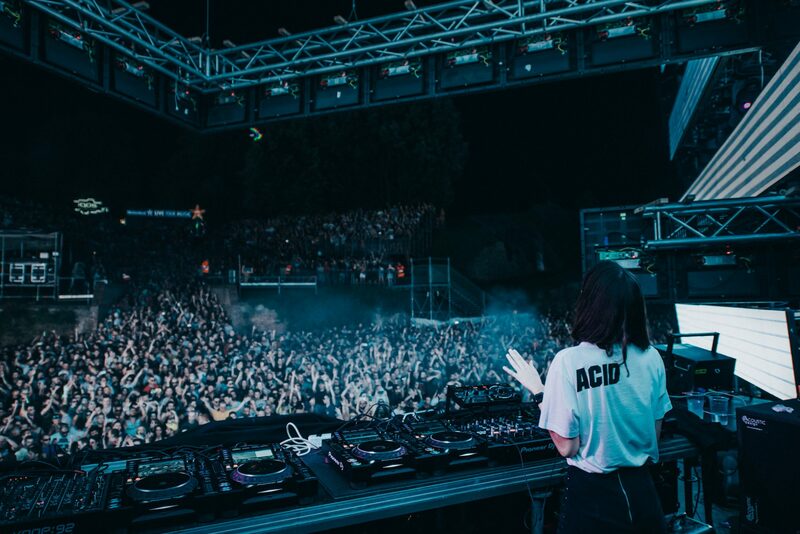 Standing at top of a plunging metal staircase that drops down into the abyss, we’re greeted by Amelie Lens who’s churning out straight-laced techno at 136 bpm. With the crowd completely on side, this was a highlight set. Played by Ben Klock on Thursday night: You’d struggle to find a more perfect matrimony than Ben Klock and EXIT festival. The Klockworks boss and Petrovaradin Fortress are quite simply meant to be. Standing front and centre of a monumental, futuristic lighting grid as Klock rattles through hypnotic groove after hypnotic grove is an onslaught on the senses for all the right reasons. His two hour set flies by as he refuses to give the arena an inch of respite. Played by Midland on Thursday night: As the clock hits 3am we head to the No Sleep Novi Sad stage to catch one of the most watchable DJs on the circuit at the moment, Midland. He meanders his way from acid into italo before dipping into low-end electronica all with a beaming smile on his face. It was a set full of highlights but as the weighty percussion and hypnotic groove of Hessle Audio’s latest release seeped through the system it was the first time in the night that we felt truly content. Played by Craig Richards b2b Nicolas Lutz on Thursday night: One for the heads and one full to the brim with unknown entities and journey music. Craig and Lutz don’t disappoint for a second as they expertly blend otherworldly, marching soundscapes as daylight began to break through into the arena. Played by Blackhall & Bookless on Friday Morning: As the first night comes to a close at 8am the majority of the 30,000+ crowd had already found their way out of the festival site. However, we heard rumours of an afterparty within the fortress and we were led in the direction of ‘Bastion’ a hidden gem tucked away somewhere. By the time we arrive, Jaunt head honchos Blackhall and Bookless were already fully committed to providing a welcome change of pace in the form of an S Man classic 12 inch. Later we discover it was picked up by the boys in HMV when they were 15 years old. Played by Eric Cloutier on Friday night: EXIT festival possessesmore than 40 different arenas and we had to be explorethem all. It took close to threehours to venture around the rest of arena’s, but they struggleto hit the heights of the outstanding selection we’dbeen tothe night before, so we headed back in the direction of No Sleep Novi Sad stage to catch Detroit’s own Eric Cloutier. Blistering 130bpm grooves had the entire stage moving in unison. Played by Bryan Kasenic on Friday night: Potentially one of the best finds of the weekend. Kasenic threw down Forward Strategy Group’s remic of ‘Sama Doma’ by Lag within a set that had already hit new heights and seemed to wake up parts of the sub that was yet be used. Pure low-end boogie at its best and the type of track that instantly convinces you to turn your mobile data on in order to capture that ‘oh-so essential’ shazam. Played by Mike Servito on Saturday morning: As the finest selectors so often do Mike Servito read the crowd, arena and situation and knew exactly what was needed. He effortlessly flipped the script to put more of a focus on the melodies that are so essential come sunrise. Justin Strauss’ remix of the 808 State classic ‘Pacific 212’ stood out in our minds. Played by Grace Jones on Saturday night: Come 11.15pm on the Saturday night there was only once place you simply had to be. The one and only Grace Jones and her band threw down a level of funk EXIT festival had never encountered before. She didn’t disappoint for a second as she eased her way through hits including: ‘Libertango’, ‘My Jamaican Guy’ and the immaculate ‘Pull Up To The Bumper’ all with a level of swagger, style and honesty only Grace Jones command. She even proclaimed: “I may have had too much ecstasy” before beat-boxing a 4x4 beat she could make out from the adjacent stage. Levels! Played by Helena Hauff on Sunday morning: Our brand new cover star dished out a double-dose of electro, techno and acid which is perfectly epitomized in this raw new-wave club weapon courtesy of Locked Club. Played by Dana Ruh on Sunday night: The Broquade boss stepped up to the plate on Sunday night and took complete control of the entire arena. Playing tougher than usual while maintaining house elements throughout, she managed to unlock frequencies that had yet to have been heard on the stage all weekend. Played by Nina Kraviz on Monday morning: The big one. Nina’s closing sets at EXIT festival have now reached legendary status and she’s previously mentioned it’s one of her favourite sessions of the year. 55,000 people passed through the festival turnstiles on the Sunday and come 6am it felt like every single one of them had come to watch Nina in action, unsurprisingly they witnessed her at her very best. Three hours of relentless rhythms, chimes, outrageous blends and plenty more all capped off with an encore of ‘Ghetto Kraviz’. The track of the set though must go to Jeff Mills. Until next time EXIT. To put it simply, you blew us away.